Home Road Trips USA 2009 Green forests, juicy meadows and…. the Grand Canyon! Green forests, juicy meadows and…. the Grand Canyon! Getting ready to leave Page. We have stayed there long enough and have seen everything and driven every gravel road we wanted – time to move on! We are heading towards the Grand Canyon North Rim. It’s only about 2 hours driving. We are driving along the Vermillion Cliffs, beautifully red and white colored sand stone cliffs for about 30 miles on HWY 89a. Shortly thereafter the road leads up to an elevation of over 6000 feet and into a completely different vegetation. Within a few miles only we find ourselves in green forests and juicy meadows. A wonderful change for the eye. At Jakob Lake we get some gasoline and a sandwich and head south on HWY 67 towards the North Rim. This change in elevation also means a big drop of the temperature: in Page this morning it was about 78 (26 Celsius) and at the Grand Canyon at up to 8800 feet hight it is only 54 (12 Celsius). The weather…. well the weather doesn’t favor our plans today: the sky is overcast and it doesn’t want to clear up until the evening. It’s still a very nice trip and we see a lot of deer along the road on the meadows and in the forests and even some Bisons at the entrance of the park. We spend all afternoon walking around at the different view points enjoying the different sights into the canyon. 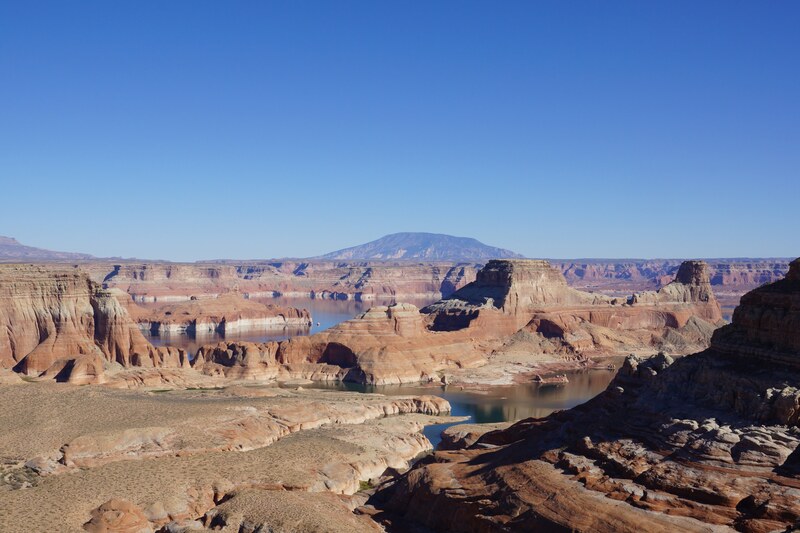 Towards 5:00 pm we leave the National Park again and drive to Kanab. A nice little town with lots of Hotels and Motels.